2014 here we come! We hope you are as excited about the new year as we are. The holidays are always a great time to refocus and make a new year's resolution. We are determined to sew up some great samples that have been waiting in line. If you too have a pile of UFO's, come join a retreat this year (or maybe two or three retreats). Getting away from the house is a great way to have fun and be productive all at the same time. 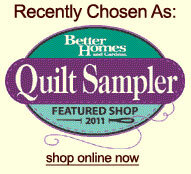 We would love to have your sew group or guild come to Quiltagious Quarters this year. Click here to look at our calendar for openings. Also, we usually have several groups throughout the year that need a few extra people. Send me an e-mail if you have a favorite time of the year to "retreat." To see all our great classes from January-April, click on the link below. Jackie Brown has a machine quilting retreat that is happening Feb. 7th-9th- click here. We have room for a couple more if you want to improve your domestic machine quilting skills. Alice begins a new BOM class series in February. Jackie Brown has just finished quilting Alice's, "Hummingbirds and friends" so a picture will be coming very soon. We will have an educator from Silhouette for the Cameo cutting system the week before the Dallas Quilt Celebration (probably class will be March 6th). As we finalize the details with him, more information will be sent out. We will also have the inventor of Terial Magic, Terry McFeely, in our booth at the Dallas show. You will want to see her new product in action. We are excited to have Jackie Brown teaching in our store and at our retreat center again this year. She is starting our Long Arm Quilting Club in April. We plan to have a meeting once a quarter. There are so many "tricks of the trade" and products designed to help you achieve your long arm quilting goals. If you have a long arm machine or a sweet sixteen unit, we hope you will join us once a quarter to learn, share, and have fun. Once more details are finalized it will be posted in our classes section. Have plans to start a new block of the month (BOM) this year? We have eight BOM's packaged and ready to go. Click here to take a look at what we have available. From easily pieced, fusible applique, or detailed piecing--we have all skill levels covered. There are two projects yet to be posted on our website: We have made a fabric kit for Pearl's newest project "Happy Trails." 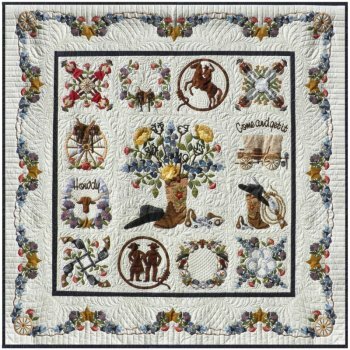 Our newest BOM is actually a small quilt of the month. "Bertie's Year" is an adorable look through the life of this sweet little bird as each month passes. Fabrics arrived and kits will be ready next week. This picture shows them joined. Store sample in progress. Pictures posted in store show our kit contents. NEWS Flash: Pearl of P3 Designs has added two retreat dates in June for you to have the opportunity to learn freezer paper starch from her directly. Click here for more information. We fly her in from California to teach at Quiltagious Quarters. Her October dates have been extremely popular so she agreed to add another trip to Texas just for YOU! E-mail to reserve a spot while they last. Beginner Class by Lynda Lindstrom Saturday January 25th or Thursday February 27th from 9:30-4 for $40. Ready to start your journey into the world of quilting? 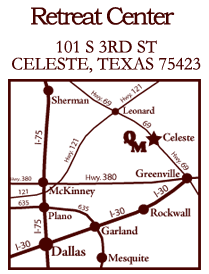 Click above to find out more about this class. Want to join? We need to know by Tuesday January21st for class this Saturday. Long Arm Machine Quilting classes by Jackie Brown every Wednesday beginning January 29th. Look at our class schedule to see dates for Level 1, Level 2, or Level 3 classes. Jackie starts with beginners in her Level 1 or she can advance your skills in Level 2 or 3. Dear Jane class series by Sarah Francis from 10-3 for $10. For 2014 this group has changed their meeting dates to the first Saturday of each month. Chenille Class by Lynda Lindstrom Thurs. February 6th from 9:30-3:30 for $35. Many of you have loved the many panel chenille samples we have throughout the store. Let Lynda show you how to chenille a panel, woven fabrics, or regular cotton fabric. For the panel project she plans to show how to add an outside border the flip and sew method so your whole project is easily done on your sewing machine. Crazy Patch Mantel piece by Alice Wilhoit Thursday February 13th & Thursday March 27th from 10-3 for $50. This is a two session class. What a perfect way to use this wonderful quilting technique. Sample in store. Alice Wilhoit's new applique series begins February15th-third Saturdays: Be the first to make Alice’s new quilt pattern, “Hummingbirds & Friends”! 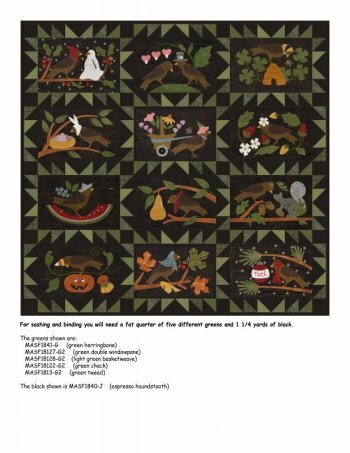 This lovely 80” x 80” quilt will satisfy any bird lover. Alice has brought your favorite birds to life using embroidery needlework details. In this 10 month class, she will teach you as many appliqué techniques as you are wanting to learn. We all have our favorite methods that we tend to stick with….this could be the year that you add many more techniques to broaden your knowledge base. In this ten month class, you’ll learn many traditional embroidery stitches plus many more that Alice has developed. These classes are always fun! Reserve your seat now! Note from Alice: "Class is from 10 – 2. Price is $15. I will take cash, check or credit card. Student can pay all up front or monthly. I can run student's credit card. Student needs to make a commitment to be in class and keep up with monthly assignments. When class nears end, I’ll schedule a retreat for those that want to finish with my help." Hand Quilting by Sarah Francis Thursday February 20th or Saturday May 24th from 1-4 for $20. Learn to hand quilt those special projects! Sarah is an award winning hand quilter. Buggy Barn technique class by Lynda Lindstrom Saturday February 22nd from 9:30-3 for $35. What a fun way to make a quilt. See class schedule for more information. You can choice from three patterns: chickens, cows, or stars inside heart. Desert Sky Judy Niemeyer class by Eileen Urbanek Saturday April 5th from 9:30-4 for $45. Eileen will teach you many tricks that make these paper piecing projects by Judy SO much easier!